— This article by Jerry Cates was first published on 23 October 2015, and revised last on 12 September 2016. © Budsinthenews Vol. 6:10(8). Peppermint (Mentha × piperita), is also known as M. balsamea Willd. 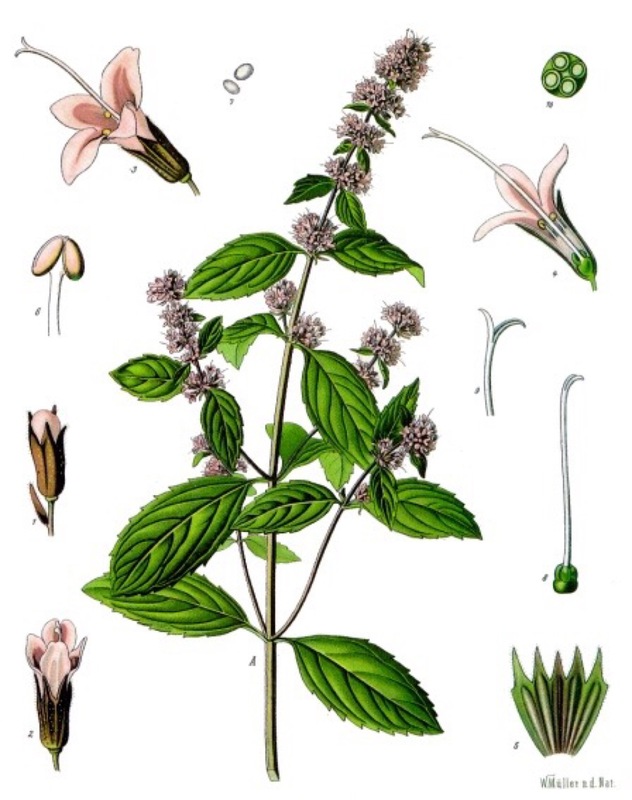 As the species designation — G x s — indicates, it is a hybrid, being a cross between watermint and spearmint, and as with typical hybrids is usually sterile, produces no seeds, and propagates vegetatively via its wide-spreading rhizomes. This botanical, which is indigenous to Europe and the Middle East, is widely cultivated throughout the world. Peppermint prefers moist habitats proximate to streams and drainage ditches. A hardy plant, it usually manages to grow wherever it is planted. Peppermint leaves and flowering tops are collected for culinary and perfumery purposes once the flower buds begin to open and can be dried. Peppermint extracts have a high menthol content, and the oil contains menthone and carboxyl esters, especially menthyl acetate. Dried peppermint typically has 0.3–0.4% of volatile oil containing menthol (7–48%), menthone (20–46%), menthyl acetate (3–10%), menthofuran (1–17%), eucalyptol [1,8-cineol] (3–6%), and minor amounts of limonene, pulegone, caryophyllene and pinene. References: In process… we do not post references that are not in our at-hand library and that we have not thoroughly examined. The vetting process takes time. A list of appropriate references relevant to the matter presented in this article will be posted as it becomes available.